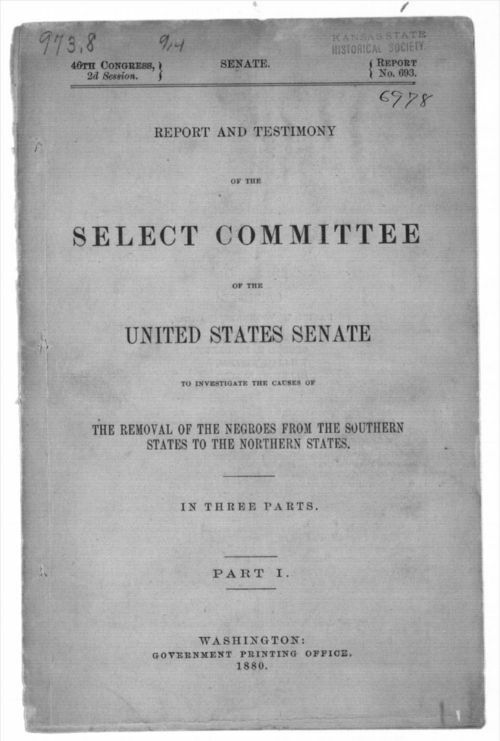 This report, written by the majority party of the Senate select committee investigating the Exodus, outlines the majority's conclusions about why Southern blacks were emigrating to the North during the post-Civil War period. This committee, composed of majority and minority parties, had taken testimony from hundreds of people having direct knowledge of the exodus movement. In essence, the majority party (the Democrats) concluded that blacks in the South had not emigrated due to "any deprivation of their political rights or any hardship in their condition" in their home state. Furthermore, the report maintained that aid societies in the North (such as the Freedmen's Aid Association of Topeka) were working with the Republican Party to encourage black emigration for purely political means. The majority party was composed of three senators: Daniel W. Voorhees (Dem., Indiana), Zebulon B. Vance (Dem., North Carolina), and George H. Pendleton (Dem., Ohio). Because this report is a bit lengthy it should be excerpted for student use. It includes a very clear explanation (from the Democratic perspective) of how conditions in the South had been "exaggerated" which provides a counterbalance to sources that discuss the atrocities committed against Southern blacks. It would be useful to compare the first few pages of this document with the minority party's report to see how they differed. These two parts of the committee heard the same testimonies yet came to radically different conclusions.